To help accomplish SPES’s strategic goal to “Operate a fiscally, environmentally and socially responsible organization” several of the staff have formed a Green Team which meets to discuss sustainability issues at SPES. To date the team has implemented several new strategies to increase sustainability within our office such as a providing information to staff, increasing our organics recycling, and reducing our plastics waste. This week the team spent their meeting time by giving the Stanley Park Earthen Architecture “Cob House” popcorn stand roof a little attention. 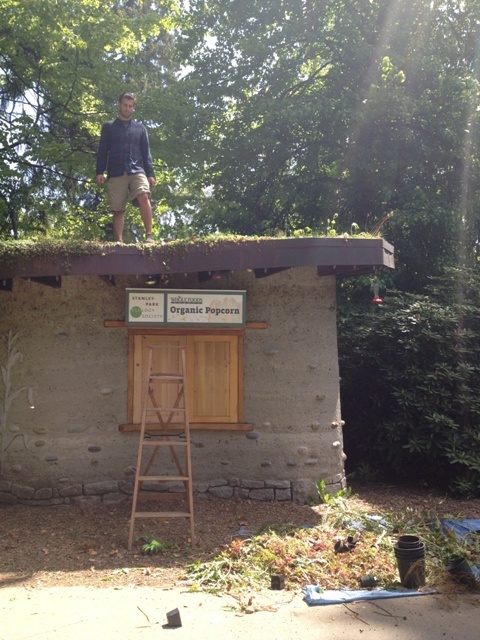 The living roof was weeded of invasive species and some hardy herbs that have self-seeded over the past couple of years, and native species were planted in their place. Our aim is that the herbs will be used by SPES’s Urban Camping staff in food preparation once they get big and strong. There will be more initiatives to come, so stay tuned!